Our preview of the US Open features all the betting offers available for existing customers. Find out who is paying the most places and what money back specials are available. Each year the US Open is hosted at a different venue, and for 2018 it’s the turn of Shinnecock Hill. The US Open is known to be the toughest of the four majors. That can’t be said though for last year’s tournament when Brooks Koepka finished 11 under par. 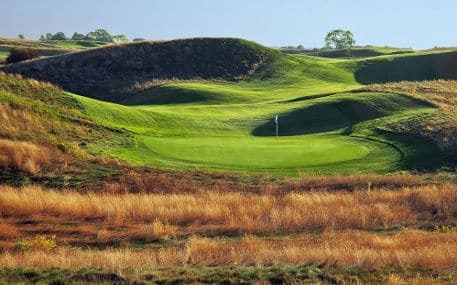 It was the first time it had been played at Erin Hills and the surprising lack of wind made it easier for the players. Shinnecock Hill last hosted the US Open in 2004 and at that tournament, only two players finished under par. The course has undergone a renovation and the fairways are now wider, averaging 41 yards. That is 15 yards wider than they were last time, suggesting we won’t get a repeat of the 2004 stats. Although the fairways are wider, they have been made smaller for the US Open. Five acres of the fairway has been removed. This modification so late was as a result of the low scores at the US Open last year. The linksland is set in an exclusive Long Island enclave and the absence of wind should not occur again. It’ll favour players who perform well on links-style courses. That sees Dustin Johnson, Rory McIlroy, and Jason Day lead the market, but all with reasonably long odds. Being one of the majors, there are lots of betting offers available. All of these can be found on our golf page too. Paying 8 places and money back if your player comes 2nd or 3rd (Boylesports) – This is possibly the best offer for the US Open. Those favouring EW bets can get enhanced places and money back in one offer. Back a player to win, and you’ll benefit from 8 places at 1/5 odds, and if your player doesn’t win, but does come 2nd or 3rd you’ll also receive money back as a free bet. Get Paid Out as a Winner If Your Player Leads After the First Round (Betway) – Place a pre-tournament outright winner bet on the US Open, and if the player you back is the leader at the end of the first round, Betway will pay you out as a winner. Money Back if McIlroy or Johnson Wins (888sport) – Place a pre-tournament bet of exactly £20 on any other player and if Mcllroy or Johnson win, 888sport return your stake as a free bet. Money Back if Rory McIlroy Wins (Sun Bets) – This is an alternative to the 888sport offer. If Rory McIlroy wins the US Open, Sun Bets will refund losing bets on the outright and outright win only markets as cash, up to £20. Restricted to just McIlroy, but can have a smaller stake and is refunded as cash. Paying 10 places at 1/5 odds (Paddy Power) – Paddy Power is paying out ten places at 1/5 odds. This is the highest available. Money back if your player comes 2nd or 3rd (Winner) – Similar to the Boylesports offer, but minus the place terms. Back a player to win the US Open and if your player doesn’t win, but does come either 2nd or 3rd, Winner will refund your losing stake as a free bet up to £25. Who is Favourite to Win the US Open? Dustin Johnson will stat as the favourite. He is an expert on links courses and is in good form having won the FedEx St Jude Classic last week. Priced at 9.00, that gives him an implied probability of winning at 11.1% (according to our odds converter tool). He is the clear favourite as Rory McIlroy is priced much longer at 15.00. This long price is formed on the basis McIlroy hasn’t won the US Open previously and has missed the cut the last two months. This gives him a predicted chance of just 6.7% of winning. Our betting calculator shows that £10 would return £140 profit if he can win it for the first time. The only way to watch the US Open in the UK is on Sky Sports. Coverage starts at 6 pm on Thursday. It is not possible to stream unless you have a Sky Go account. If you’re counting down the minutes, and want some build up coverage, then switch to Sky Sports Golf. There is build up coverage all day every day leading up to it on Thursday.